DUP leader Peter Robinson has denied claims made today that he was set to receive a payment as a result of the Nama property deal. Jamie Bryson, a high profile loyalist blogger and flag protester, said Peter Robinson was among five people to receive a share of a "success fee" linked to the £1.2 billion sale of assets owned by Nama (National Asset Management Agency) - the Republic's so-called bad bank. In a statement released this afternoon, Mr Robinson said: “I repeat, I neither received, expected to receive, sought, nor was I offered a single penny as a result of the NAMA sale. "The allegations made today lack credibility and can have no evidential basis. The scripted performance was little short of pantomime. It is outrageous that such scurrilous and unfounded allegations can be made without providing one iota of evidence." Mr Robinson, who stood aside as first minister to facilitate talks to resolve a political crisis at the devolved assembly, also said he would be "happy" to appear before the Nama committee. 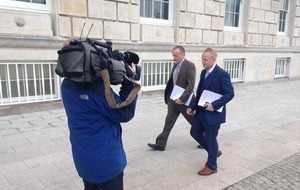 In evidence given to the finance committee at Parliament Buildings in Belfast, Mr Bryson made a series of explosive allegations and said his sources included "whistleblowers". The fee was to be paid in to an off-shore account controlled by the then managing partner of Belfast solicitors' firm Tughans, Mr Bryson said. 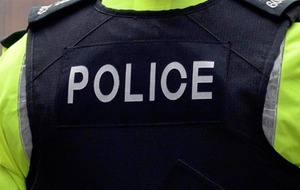 He said: "This was a success fee that was to be paid in to a dormant Danske Bank account in the Donegal Square West branch (in Belfast) and from there it was transferred to an off-shore account. "There were to be a number of beneficiaries to this fee and I will refer to them simply as person A, person B, person C, person D and person E.
"I can now tell this committee without fear of contradiction that person A is Mr Peter Robinson MLA, person B is (developer) Mr Andrew Creighton, person C is (accountant) Mr David Watters, person D is (ex Nama adviser) Mr Frank Cushnahan and person E is (solicitor) Ian Coulter." Earlier the committee voted on whether Mr Bryson's evidence should be heard in public. Members of the Democratic Unionist Party (DUP) opposed holding an open session. Political watchdogs either side of the Irish border are examining the sale of the huge Northern Ireland property portfolio of Nama which was set up by the Irish government to deal with at-risk loans. All parties involved in the transaction have vehemently denied acting unlawfully. Mr Robinson has consistently denied that he, his party or anyone in his family was to benefit. 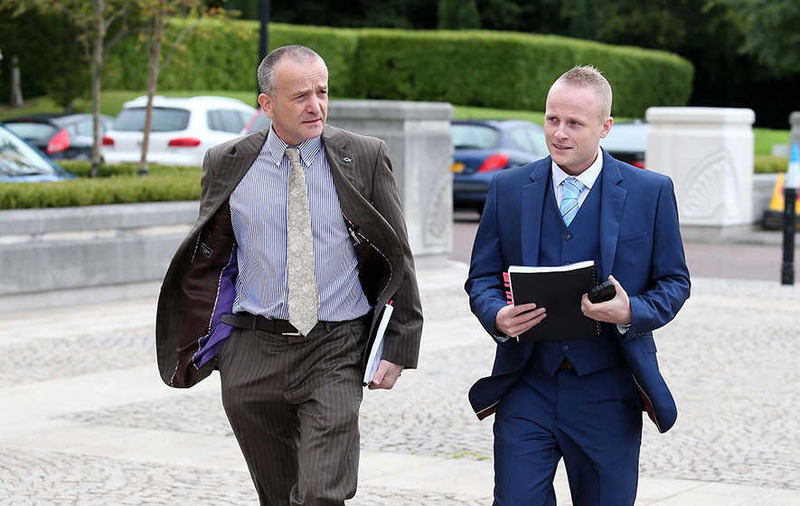 Throughout the hearing, DUP MLAs challenged the validity of Mr Bryson's evidence. Protesting that it should have been heard behind closed doors and a transcript published at a later date, South Down MLA Jim Wells said: "Here we have no direct evidence from Mr Bryson. 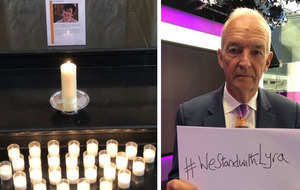 "He has now moved on to make extremely serious allegations and all he has is hearsay and his opinion." Mr Bryson hit back saying he stood over his allegations "110%". "I believe I have demonstrated a clear web of individuals, including politicians, who have contrived and conspired together to get things done and increase their own bank balances by a nod and a wink schemes," he said. The loyalist added he would rather go to jail than reveal his sources. He said: "I am giving relevant information to this committee which sources, extremely close and involved in this nefarious deal, have provided to me as whistleblowers. "I am not in a position to breach somebody's confidence before this committee." The Nama sale hit the headlines when controversial Independent TD Mick Wallace used parliamentary privilege to make allegations of a political pay-off linked to the £1.2 billion sale of Nama's portfolio of property in the north. He claimed £7 million in an Isle of Man bank account was "reportedly earmarked for a Northern Ireland politician or political party". Political watchdogs on both sides of the border are examining the circumstances surrounding the Nama multi million deal while the National Crime Agency has also launched a criminal investigation. All parties involved in the transaction have vehemently denied acting unlawfully and Mr Coulter, the lawyer who transferred money, has denied it was intended for any politician. 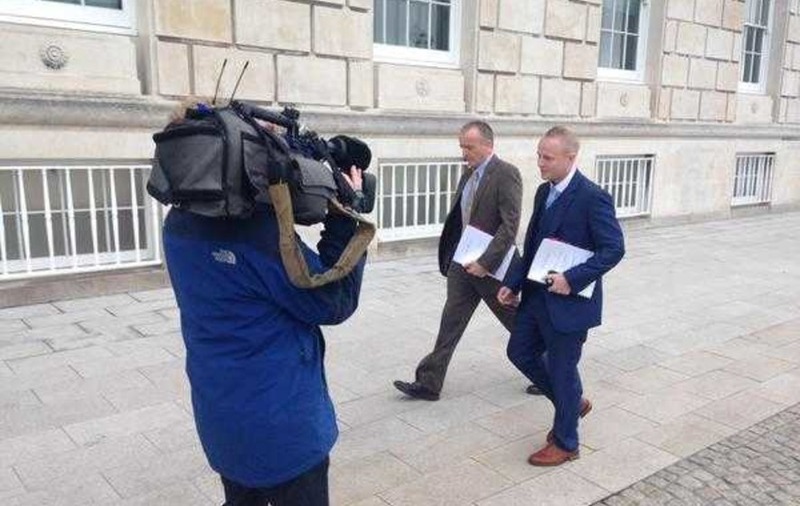 Mr Bryson was permitted to give his evidence in public following a committee vote by MLAs. Members of the DUP opposed holding an open session claiming he had not established a direct link to the inquiry remit and challenged the credibility of his evidence throughout. South Down MLA Jim Wells said: "Here we have no direct evidence from Mr Bryson. However, Mr Bryson hit back telling the committee he stood over his allegations "110%". When pushed to reveal the source of his evidence, the well-known loyalist from Bangor, Co Down said he would rather go to jail than betray a confidence. Under questioning from Sinn Fein's Mairtin O Muilleoir, Mr Bryson batted away any suggestion he was motivated by a dislike of the DUP. "It is no secret that I have absolutely no time for the DUP but I am here to provide evidence," he said. Earlier Martin McGuinness told MLAs he had not been fully engaged or fully briefed on the Nama deal. The Deputy First Minister said he had been "kept in the dark" about a meeting at Stormont Castle between DUP ministers and former US vice president Dan Quayle. He said: "I find it incredible that the First Minister did not tell me that a former US vice president was in Stormont. "I can't get my head around that." An important memorandum of understanding document relating to the Nama portfolio sale was also sent to the authorities in Dublin without his consent, Mr McGuinness said. Afterwards, chairman of the finance committee Daithi McKay, confirmed that Mr Robinson would be invited to give evidence. The public were entitled to answers, he said. "Throughout this inquiry process I have repeatedly said that the public want openness and transparency on the sale of Nama's northern portfolio. 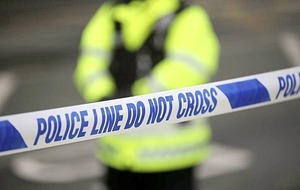 "This is a hugely important issue and the public want and are entitled to answers. "I was pleased that we had openness and transparency today with the evidence sessions being conducted in public. "The committee also agreed today to invite former first minister Peter Robinson to come before the inquiry to answer the serious allegations which were made today."